But where are they? And what should you do when you get there? From national parks and monuments, to baseball stadiums, beaches, and amazing road trips, we narrowed down the most iconic, popular, beautiful, historic, fun, delicious, awe-inspiring (should we go on?) parts of the country to 50 must-do places/activities. And while, sure, some are obvious and others may be a little cliche -- they're all still distinctly, 100% America. Now, how many have you ticked off your list? Even if you fell asleep repeatedly in history class, walking this 2.5-mile path (just follow the red-brick line!) 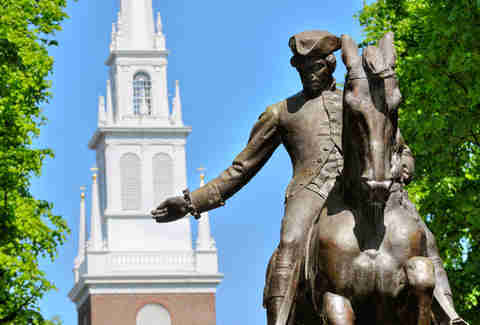 that passes 16 historical landmarks -- from Paul Revere's house and the Old North Church to Bunker Hill and the USS Constitution -- is a must for any American. Just don't forget to stop at the Union Oyster House, one of Boston’s oldest restaurants, along the way. 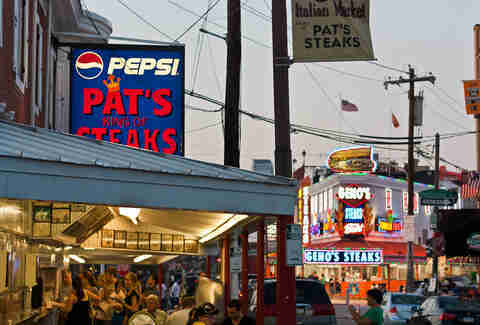 Team Geno's, just saying. Although, yes, we know there are A LOT of places to get a great cheesesteak in Philly, which is why we put together this neighborhood guide. 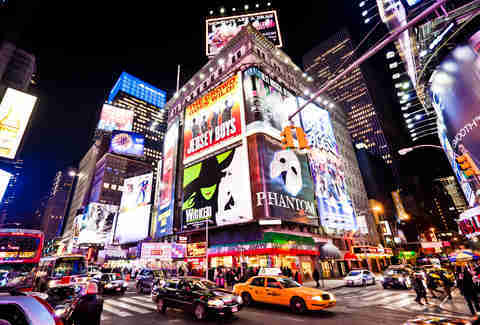 If you can't score Hamilton tickets (don’t worry, pretty much no one can), hit up the TKTS booth in Times Square for same-day discounted show seats to something; then take your obligatory "NYC baby!" selfie and get the hell out of there. Trying to tackle all of New York's greatness is like trying to keep up with every new dating app, it's damn near impossible. Concentrate on the biggies: eat a pastrami sandwich at Katz's Deli, walk across the Brooklyn Bridge, and stroll through SoHo and Greenwich Village. Yes, there's a lot you don't understand about the Cape, but that's exactly why you should see it all. From the Bourne Bridge to the Chatham Light (and the Squire! 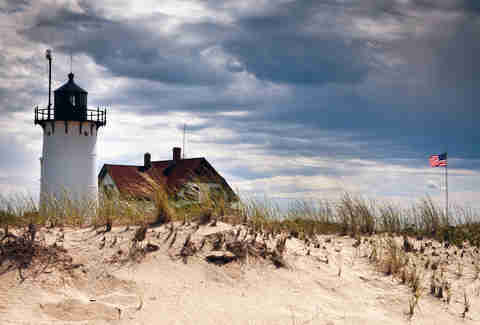 ), Truro's vineyards to the the Cape Cod National Seashore, plan to eat lobster rolls along the way at one of these waterside spots, stop for a drink at the Beachcomber in Wellfleet, and end the night strolling around Provincetown. 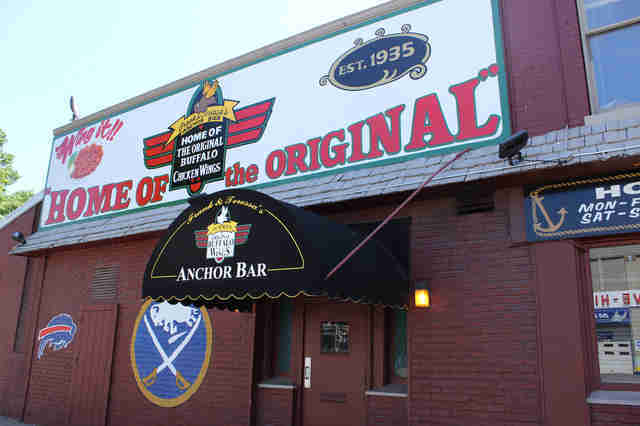 You sort of have to go to Anchor Bar, the famed "birthplace" of Buffalo wings. And when you're done enjoying wings (and live jazz! ), walk it all off on an architecture tour of seven Frank Lloyd Wright structures. The best way to cruise DC's many landmarks is on a two-wheeler. 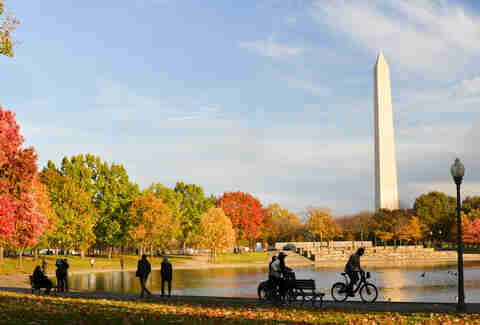 Start in Rock Creek Park, head along the Potomac, and finish on the National Mall, peddling past the Lincoln Memorial, and the Jefferson Memorial, and the WWII Memorial, and the Vietnam Veterans Memorial, and the Washington Monument... you get the idea. Stop and peruse the Smithsonian museums. End at the Capitol and Union Station. Ideally, do all of this in the spring when you can also appreciate about a million cherry blossoms. Afterward, grab a beer at District ChopHouse & Brewery -- you earned it. Sure, maybe it's one of the biggest tourist traps in the whole damn game, but it's one you want to get caught in. Buy a ticket, put on your plastic poncho, and hop aboard Maid of the Mist. Be extra legit about it by boating up to Cantler's Riverside Inn in Annapolis. 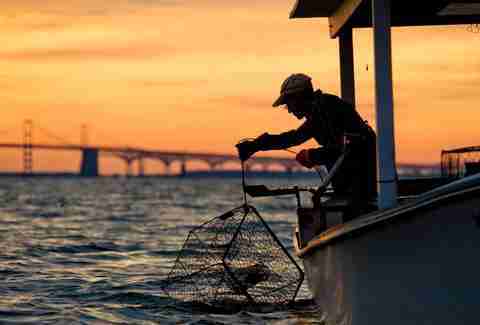 And when you're done cracking crabs, stroll through town or tour the Naval Academy. 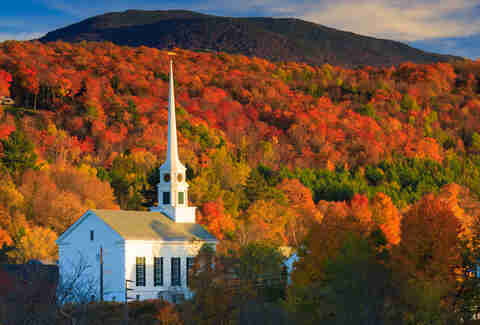 The move here is to hop a car during peak foliage season (usually in October) and cruise Vermont's byways, a collection of 10 roads that winds through the state's farmlands, forests, and glorious Green Mountains. Then drive up through New Hampshire (maybe hit this bar that sits in two states) and keep heading east into Maine, only stopping for syrup and cheese along the way. 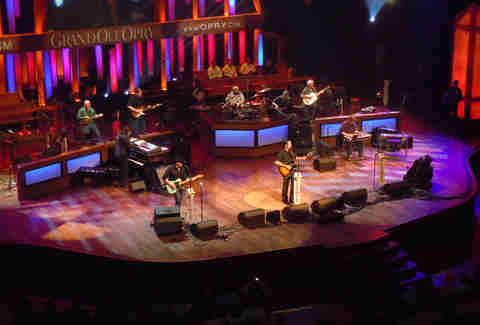 You can't go to Nashville without going country, and this barn-structured stage has housed the world's best (from June Carter to Dolly Parton) since 1925. 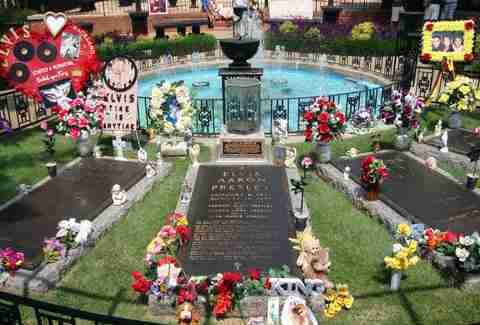 Sitting in those red velvet seats literally makes you part of music history. Also, Nashville is our No. 1 city in America to spend a weekend -- and this is why. 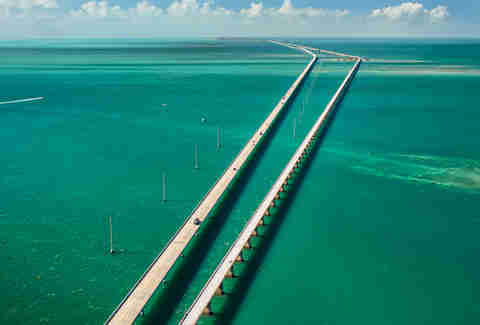 One of the coolest drives in America, the Overseas Highway (aka the southernmost section of US 1) stretches 113 miles over 42 bridges (including Seven Mile Bridge) across all of the Florida Keys. Once you get to the southernmost point in Key West (there's an actual "point" you should selfie next to, duh), snag a slice of Key lime pie at Blue Heaven and drink your way down Duval St. This is all after you've partied your face off in South Beach, of course. 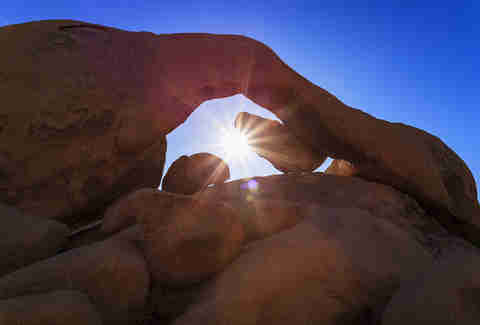 Better yet, rent an RV or pitch a tent in the North Park and spend the whole weekend there. It's totally free and means you'll be hanging out with more than 100,000 of your all-time weirdest (in a good way) friends. Remember learning what a big deal this battle was in social-studies class? 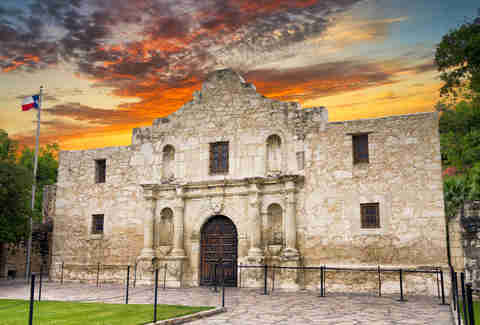 Sure, it might be just a building that some find disappointing, but this pivotal part of Texas and American history is still worth seeing; and after you do, head over to the pedestrian-only River Walk (you know, that tourist-friendly stretch you see during every Spurs home game on TV) and enjoy the bars and restaurants (Pearl Brewery = yes). Now, if you really want to go native -- spend a weekend night at the Cowboys Dancehall. Is it a dancehall? A rodeo? A concert hall? Boxing venue? A place with lots of beer and mechanical bulls? Yes. All of that. Texas forever. 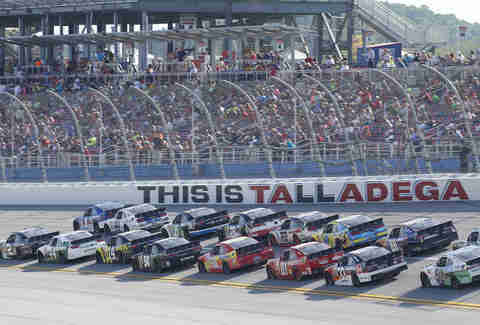 Preferably several, from the infield. While (not-ironically) wearing seersucker or a fancy hat. Not on the same day (be smart! ), but you also shouldn't leave the state without hitting a few of the distilleries on the Kentucky Bourbon Trail. 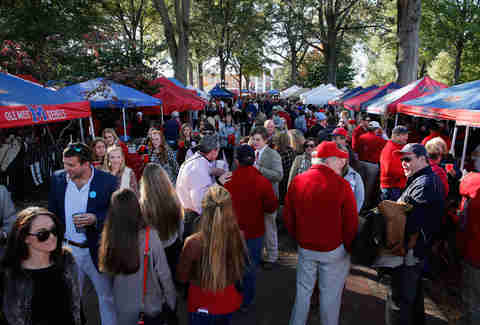 Honestly, you can't go wrong with pretty much any SEC tailgate (unless it's Vanderbilt), but few schools throw the kind of pre-game party like you'll find at the Grove. You should also probably sit in the student section for the game. Alternate venue: if for some reason you're like, no way I'm going to Oxford, I don't care if it's Faulkner's hometown and that it has that really cool three-building bookstore, the Auburn-Alabama Iron Bowl in Tuscaloosa is your move. Experience Austin in all its true weirdness by avoiding the massive nerd convention and doing it up like the locals. 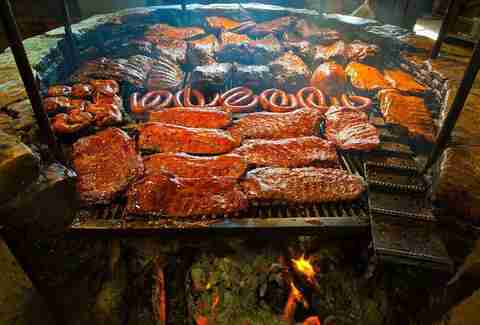 Rather than make time for it all, concentrate on stuff like a breakfast taco tour, a dip in Barton Springs, and BBQ at one of these highly touted places (because no local waits in the massive Franklin line). The oldest town in the US (1565!) is actually good for something other than eighth-grade field trips. 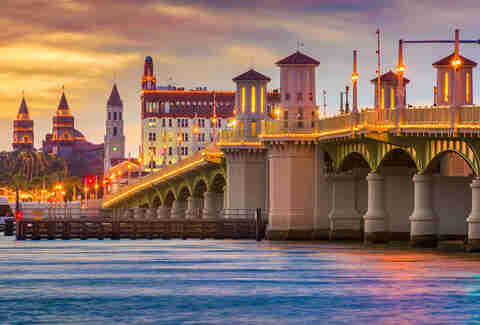 In fact, it's so great we named it Florida's most underrated destination. 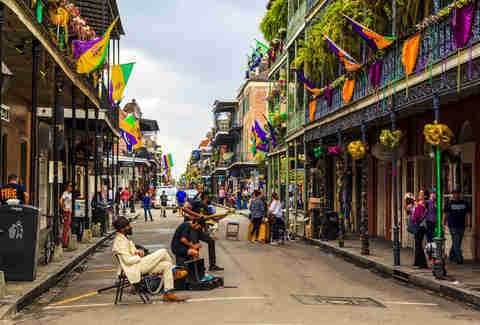 After getting your fill of colonial Spanish architecture, spend the day deep-sea fishing, and the night bar-hopping/taking a haunted bar tour in the historic section of town. The fact that the Cubs are actually -- gasp! 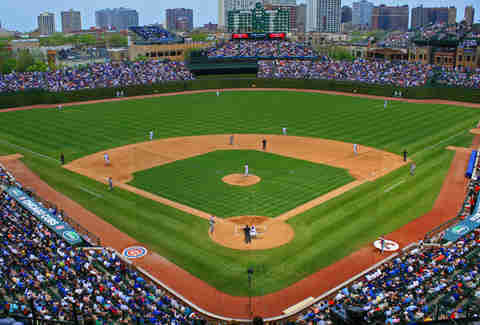 -- contenders now only makes this epic sports pilgrimage that much better. Shoot for a Cards game, sit in the bleachers, and drink Goose Island while taking down a Chicago-style hot dog. After the game, enjoy a beverage or two at the bars around the stadium -- Wrigleyville isn't known as the "world's largest beer garden" for nothing. This is about as Great Outdoors as it gets without John Candy. 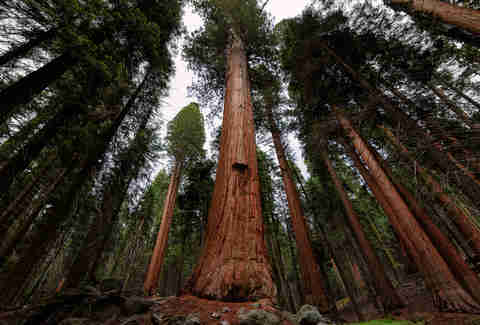 The largest wilderness area east of the Rockies, there are over a million acres of woods and more than 1,500 miles (!!) 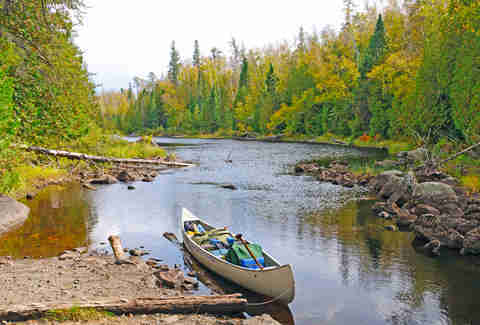 of canoe routes. Not to mention, some insane sunsets. With around 800 bands playing in 11 days, this is the biggest music fest you can attend, pretty much anywhere IN THE WORLD -- and the diversity of acts never disappoints (think everyone from Willie Nelson and Ryan Adams to Alabama Shakes, Styx, and Nelly). 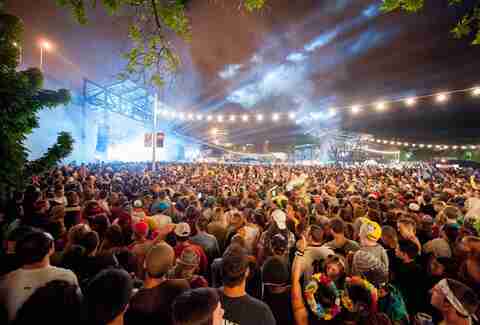 Plus, Milwaukee loves to party. Oh, and nearby Madison... well, it's one of the 25 best cities in the country to spend the weekend. So much to do in Wisconsin. 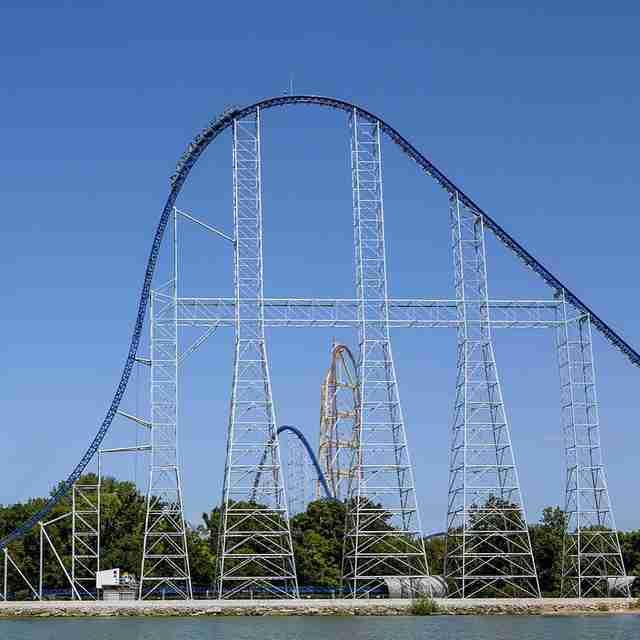 Still one of the fastest rides in the game, Millennium Force was the world’s first-ever coaster to exceed 300ft in height. And no matter how much other theme parks have literally tried to keep up since, Cedar Point in Sandusky, Ohio (opened in 1870! ), will always be the Beyonce of the group (that's Queen Bee, guys). Even if it doesn't get the respect it deserves. 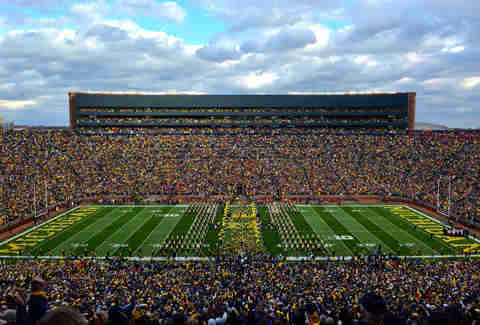 Sure, a case could be made for seeing the Buckeyes in Columbus, but come on, it's "the Big House" for a reason. Like, it actually is the biggest college football stadium in the US. Better still, hit the UM-Ohio State game and take in one of America's top sports rivalries. And when you're done, Ann Arbor is the quintessential college down (quite possibly, the best one in all the land). Stroll through the Diag, hit up Dominick's for outdoor pitchers, and grab a bite at one of these spots. 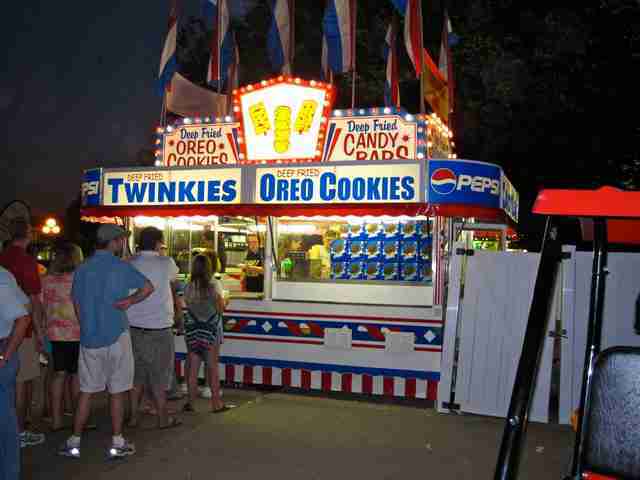 The genius of this state fair lies in the high level of culinary attention that's directed at foods eaten on a stick -- there are 75 of them on display! The ones to seek out: the deep-fried Milky Way, chocolate-covered chunky bacon, and the cornbrat (that's a bratwurst dipped in cornbread batter). Also, do not leave without seeing the butter cow. And if you really want to take it up a notch, visit during a presidential election year. There are many reasons why the Great Lakes are better than any ocean (in fact, we note 12 of them right here) and the ability to swim in water that's fresh and clean and not totally salty is only one of them. Grand Haven in Michigan is a nice spot to take said dip (as well as to visit the pier, lighthouse, and Odd Side Ales for a pint of peanut butter stout), although any of these Michigan beach towns will do just fine. Crossing the spectacular Mackinac Bridge into Michigan's Upper Peninsula, there's a feeling like you're entering a primal, Hemingway-esque world... because you are. There's no better way to appreciate the rustic UP than being up at the crack of dawn to watch the sun rise over a Great Lake. St. Ignace, the first town on the north side of the bridge, offers views of sunup over Lake Huron; head to Manistique for epic sights of the sun rising over Lake Michigan; or venture further north to the shores of Lake Superior and hit Pictured Rocks, Marquette, or -- for the truly adventurous -- Copper Harbor, at the tip of the Keweenaw Peninsula/end of the world. 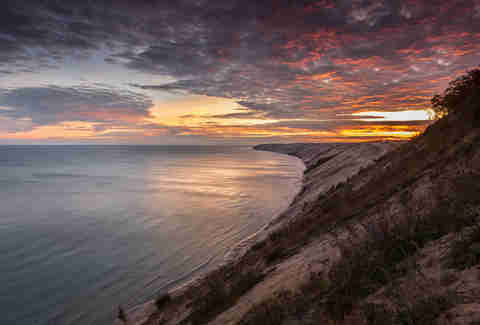 And while you're there, hit one of the best restaurants in the Upper Peninsula, and work it off with some of the best hiking you'll find anywhere. 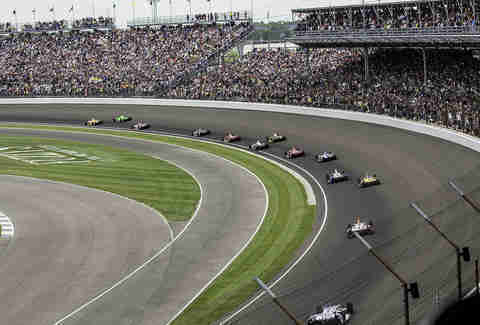 Only the greatest car race in America in one of its most underrated cities, the Indy 500 is a sports MUST. Even if you're a bike person. Do your fair share of tailgating beforehand, but be sure to catch the race from the higher seats (according to our Indy insiders, the double-letter rows) for the best views. In fact, longtime fans recommend the front straight for pre/post-race activities, and either E-Stand (first turn) or NW Vista (fourth turn) for first-timers. ... from Southern California to San Francisco. And take as long as possible to do it. 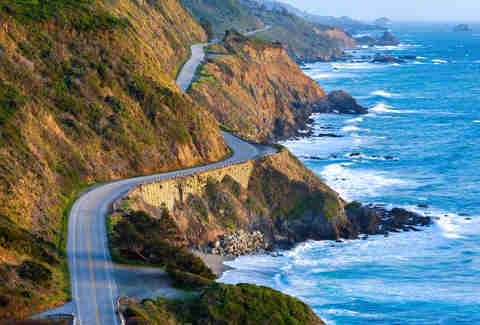 This 500-or-so-mile stretch up the coast is one of America's most iconic and scenic road trips. You're gonna want to eat in all these restaurants, stay in some of these hotels, and absolutely make a pit stop at Big Sur. In fact, consider spending a whole day there and in neighboring Carmel. Obviously, Yellowstone in and of itself belongs on this list, but if you can only see one thing while driving through the park, make it that crazy geyser that shoots water almost 200ft in the air. Just think of all the "eruption" dad jokes you can make! You'll no doubt be stopped by a herd of bison somewhere along your park journey (don't get out of the car! 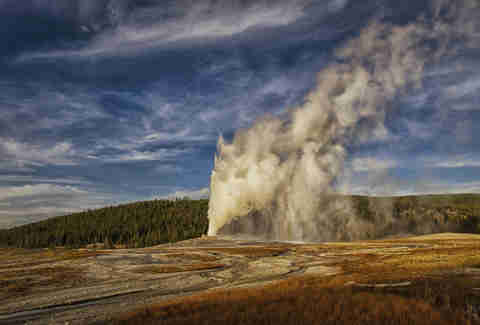 ), but once you're moving again, head to the Grand Prismatic Spring. This mountain is your ticket -- lift ticket, actually -- to arguably the most thrilling ski runs in the Rockies (looking at you, Steeplechase and Olympic Bowl). 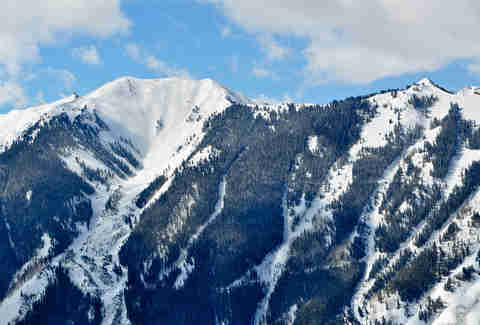 Plus, the summit offers solid views of the Maroon Bells and Pyramid Peak. Start off with drinks on the deck at the Hotel Erwin (which overlooks Venice Beach), then walk the boardwalk, pick out your favorite street performers, tour the canals, and do any of these fun things. 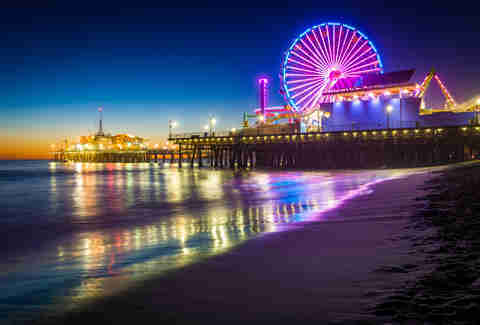 From there, make the walk to Santa Monica and ride the Ferris wheel at sunset -- the views are killer. No, you can't see an actual concert there, but still. 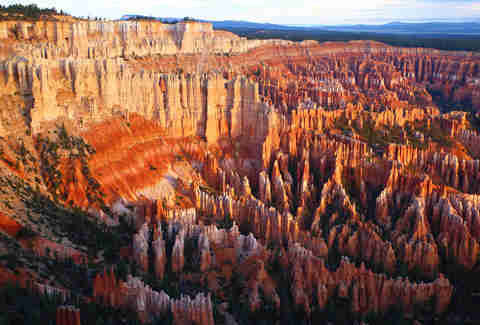 The natural rock formation is one of world's most amazing sights. 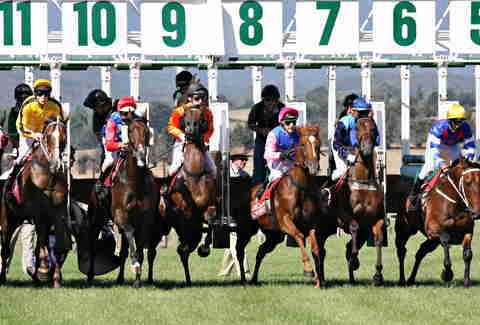 And if you don't feel like driving Highway 63 in, you can ride a horse instead. 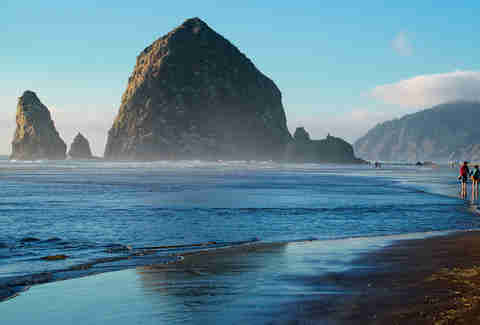 Sadly, the home of the Goonies has been shut down by the home's actual owner, but you can still eat razor clams and Dungeness at Buoy's, then head south to the Pelican Pub in Seaside yelling, "Heeeyyy you guysssss!" Although before you skip out, Cannon is one of the best small beach towns on the entire Pacific coast and well worth a little time. Don't miss the distillery. Nab a bike on a guided tour and cruise through the canyons; put your kickstand down to taste wine and olive oil. 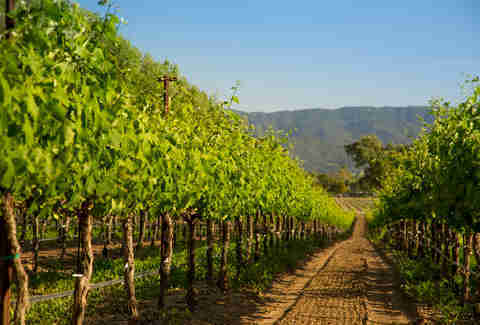 Or, take a guided picnic tour and get bussed around to four different wineries. Either way... heaven is real, guys. And take a ton of #nofilter Instagrams. This is by far one of America's most spectacular national parks, so drive up through the 6,646ft Logan Pass at the top of Going-to-the-Sun Rd to hike the Highline Trail. When you're done appreciating the glaciers, either pass out in your own damn caboose in the middle of the wilderness at the train-themed Izaak Walton Inn in Essex or head over to Whitefish, one of the coolest little towns in Big Sky country. 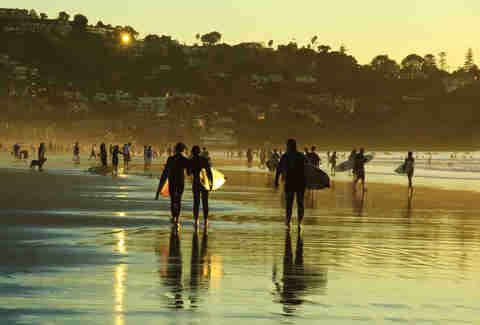 Sign up for surf school in Mission Beach, or if you're feeling fancy, nab a private one-on-one in Del Mar. Either way, celebrate that two seconds of standing by downing cheap drinks at the Beachcomber. Or maybe with dinner at Draft. But before you take the money shot, walk the half-mile loop on the Arch Rock Nature Trail and appreciate all the other rock formations. 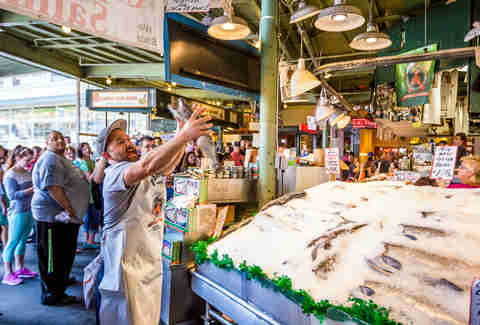 Sure, this market where dudes literally throw fish around is a tourist attraction, but it's one you can't leave Seattle without visiting. Although on the way out, you should leave your "mark" on the gum wall in Post Alley. Warning: if you don't post a picture on social media of you hugging a giant sequoia tree, it didn't happen. 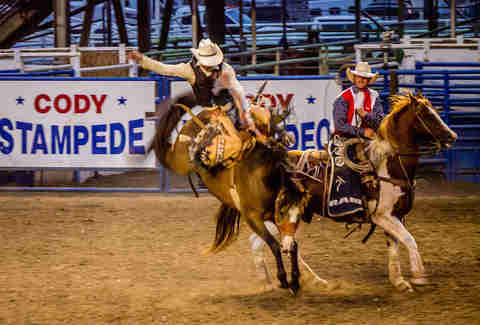 Cody Nite Rodeo happens every summer night in Cody and has been going on for 76 years. This is the rodeo capital of the world. And that is not an overstatement. Also, there are fewer than 55 days until rodeo season -- mark your calendar. But don't complain that it's smaller than you expected. It's still fantastic. Before you gaze at these stone-faced presidents, though, stop at Murphy's Pub for fried pickles and a Bloody Mary. 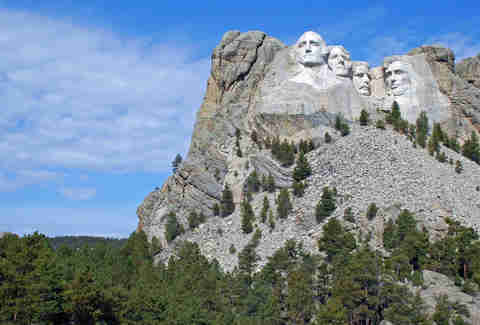 Then drive through the Black Hills National Forest. 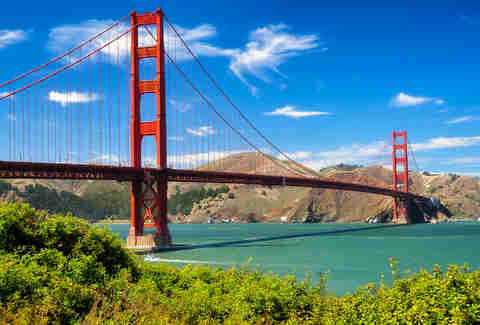 Start in the Golden Gate National Rec Area, cross over the bridge, wave to Alcatraz, then end in Golden Gate Park. After all that walking, you should hop on a cable car. 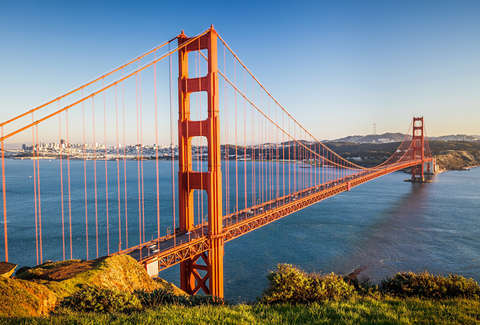 Come on, it's San Francisco! 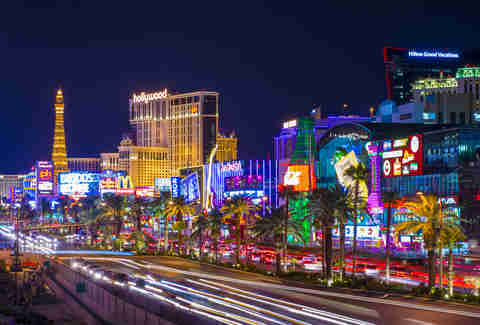 We suggest renting a car and hitting the Hoover Dam, one of the country's most impressive engineering feats, first (less than an hour drive from Vegas), because once you land on the Strip, Lord knows what's going to happen. 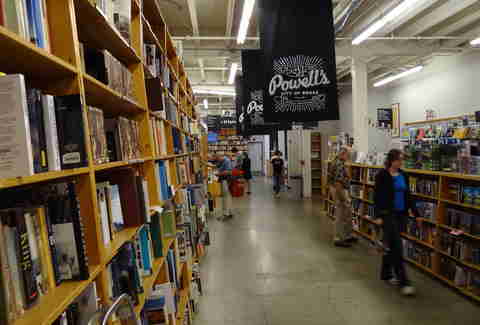 Get learned (but hopefully not lost) as you stroll through the world's largest bookstore. Founded in 1971, it takes up an entire block, stocks one (raise pinky to mouth) million books, and reportedly buys 3,000 more a day. As you're already smack dab in the middle of Portland, you'd be remiss not to spend the rest of the day hitting brewpubs like Hopworks and Breakside, donut shops, and strip clubs. The views are insane. 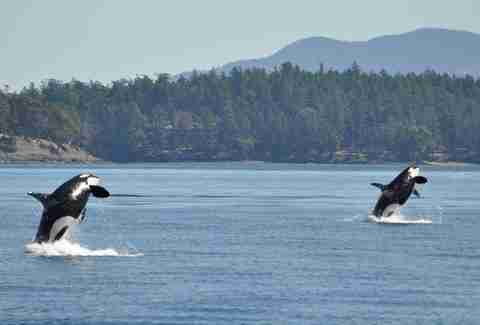 Once you get there, take a half-day kayak tour through Free Willy country to see some Orcas in a, thankfully, non-SeaWorld environment. 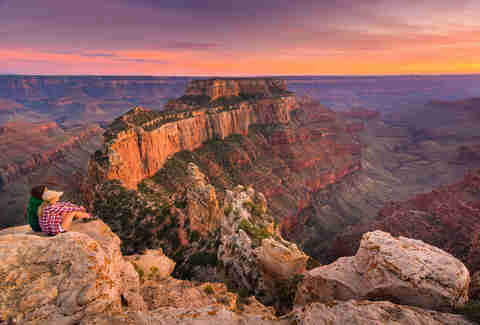 The South Rim is for tourists; the North Rim receives one-tenth of the visitors and is 1,000ft higher. Also, you can still (and should!) day hike INTO the canyon on the North Kaibab Trail. Just be sure to bring TONS of water, leave before 7am, and do NOT try to go all the way to the bottom and back in the same day. Also, also, don't wear dress loafers. Seriously, people do it -- it's nuts. 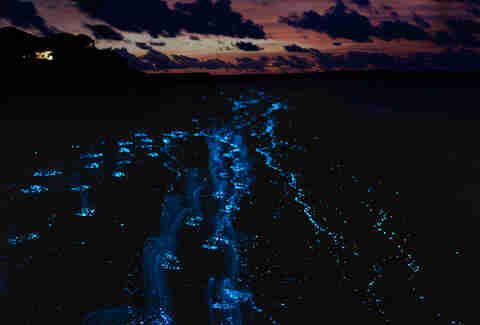 By far one of the most beautiful places in Puerto Rico, not to mention the world, Bioluminescent Bay lights up at night (thanks to science) with the blue glow of little creatures called dinoflagellates. The best way to experience the show is either by diving or on a kayak -- it's like you're in Narnia. 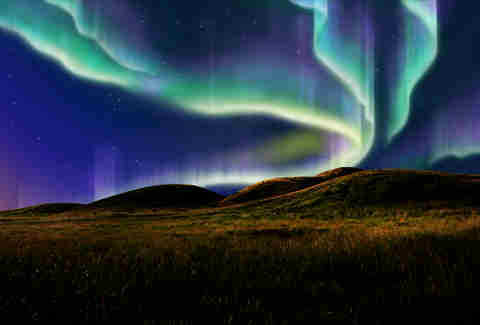 Sure, we told you that Juneau and its exploding culinary scene was Alaska's most underrated destination, but when it comes to gazing in awe of the aurora borealis (aka the Northern Lights), Fairbanks is your move. Just make sure you go during the winter (November through April) when it's dark all the time. While seeing a volcano erupt isn't really an everyday kind of thing, you can catch plenty of red-hot, bubbling, molten lava on the Big Island in Hawaii. 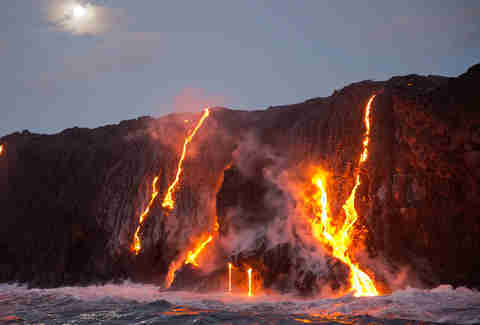 There are five active volcanoes there and you can hike right up to 'em at Hawai'i Volcanoes National Park. Or, if you'd rather appreciate from afar -- catch a helicopter ride and just pray those puppies don't go off while you're circling overhead. Liz Newman is a freelance writer for Thrillist, and was dismayed to discover she had only done exactly 19 things on this list. Tweet her how many you’ve checked off (unless it’s more than her) at @lizn813.